Matches accept "Forfeit" as a Match Result (in lieu of the usual "Win/Draw/Loss"). To declare a participant as forfeit, you simply have to tick the "Forfeit" checkbox corresponding to him in a Game or Match sheet. A forfeited participant in a match is automatically considered as having lost, and his opponent is considered the winner. If both participants of a match are forfeit, then there is no winner. Double Forfeit is not possible in a bracket, just like a Draw is impossible. If two participants are forfeit in a bracket match, you have to set one forfeit, and forfeit the other in his next match by default. 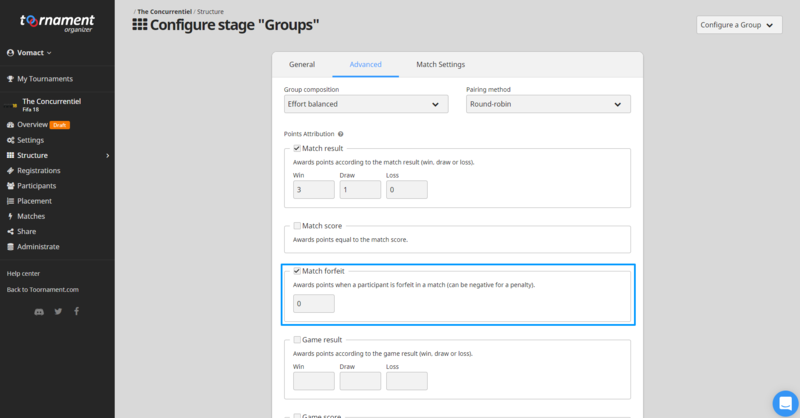 The Forfeit status is NOT calculated in a match, meaning because you set all games for a participant as Forfeits, the whole match will not be considered forfeited automatically, you will also have to declare the Forfeit at the match level. Forfeit status is displayed in brackets, league rankings etc. through with either "Forfeit" or an orange "F".